Ruling requires authorities to evaluate carbon emissions impact associated with a major methanol refinery and export terminal on the Columbia River. Opponents of a $1.8 billion methanol refinery and export terminal proposed in Kalama, Wash. are hailing an April 8 court decision that ruled the Port of Kalama and Cowlitz County broke the law by failing to disclose and evaluate greenhouse gas emissions associated with the refinery. The Cowlitz County Superior Court upheld a ruling last September by the Washington Shorelines Hearings Board, brought by Columbia Riverkeeper, the Sierra Club, and Center for Biological Diversity. The Port of Kalama had appealed the shorelines board ruling to the court. The facility, proposed by a Chinese subsidiary known as Northwest Innovation Works, would convert natural gas to methanol and export it to China. The developer notes the methanol would supplant the use of dirty coal and replace it with natural gas, which is more clean-burning with lower carbon emissions. Environmentalists argue that natural gas extracted via hydraulic fracturing or fracking can produce a comparable amount of carbon emissions due to gas leakage into the atmosphere. They note the project would still rank among the largest sources of carbon emissions in the region. "The Port of Kalama must now chose: appeal the Cowlitz County Superior Court's decision; admit the true environmental cost of methanol refining and export; or abandon this dirty fossil fuel export project," said Brett VandenHeuvel, executive director of Hood RIver-based Columbia Riverkeeper, in a prepared release. "This would be the world's largest fracked-gas-to-methanol refinery, and its impacts extend far past the facility itself," " added Jesse Piedfort, director of the Washington State Sierra Club. "Pipeline expansions, fracked gas extraction, and offsite global warming emissions all need to be be considered in the Environmental Impact Statement," Piedfort stated. Kalama is located along the Columbia River just north of Oregon. Environmentalists have been furiously fighting a wave of fossil fuel export facilities proposed in recent years in Oregon and Washington, and can claim a streak of victories. 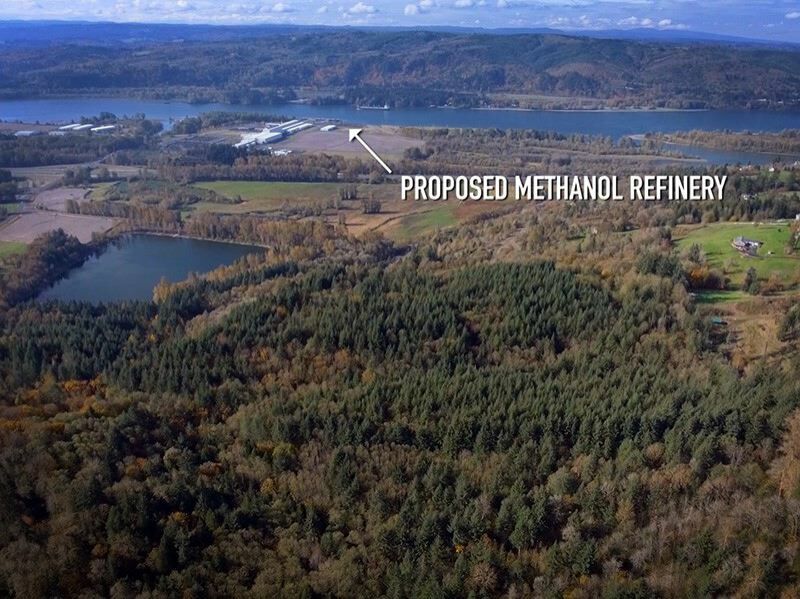 The methanol refinery is one two major fossil fuel export projects still viable in the Northwest, along with a proposed liquefied natural gas export terminal in Coos Bay that was revived by the Trump Administration. Several others proposed in recent years have been rejected or abandoned, including a propane export facility in Portland, an oil-by-train facility in Vancouver and six coal-export terminals.